During treatment, I worried on a daily basis about how my then-3 year old would be forever scarred by my illness. 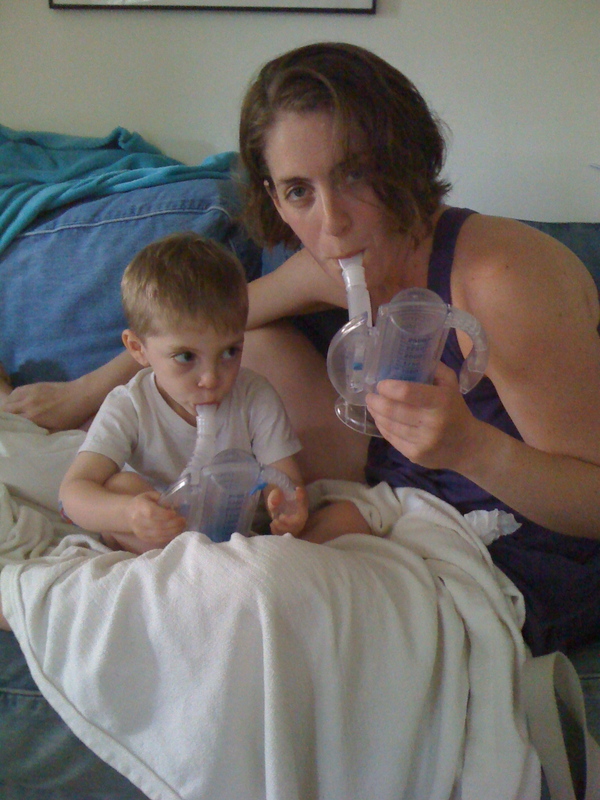 Initially, he struggled with separation anxiety, but was always eager to cheer me up with snuggles and silly faces, or cheer me on as he watched me sing through nightly injections ("Go Mommy, go!"). Each day I was unable to bathe him, or go through the bedtime routine, or drive him to preschool, I worried about how he was doing. What was he going to take away from this? Would I even be around to find out? A wise friend related this concern to her own daughter, who had connected uniquely with her special needs cousin, able to communicate and relate to him in ways that others could not. My friend told me that because of her nephew, her daughter had learned empathy, kindness, and concern for other human beings - qualities she may not have developed without firsthand experience. This comforted me immensely. I know Judah had always shown signs of being caring and compassionate, but he was only 3. I loved to think of grown up Judah as a doctor with wonderful bedside manner. Or a professor (as my mother-in-law likes to call him) who could truly relate to his students. Lucky for me, I didn't have to wait 30 years to find out who he would become. This afternoon, he had an early dismissal from school (first year of kindergarten). I arrived a few minutes early and hid behind a tree to watch him play on the playground. My first prayer was answered - he wasn't all alone. He was happily see-sawing with 2 girls and 3 boys - all of different colors. The teacher in me was thrilled to say the least. Relief and pride pumping through my veins, I walked over to the door where his class gets dismissed and noticed the mother of one of the other girls he'd been sitting next to on the see-saw. Judah had informed us last week that he and this child were in love with each other, and with a smirk on his face, that they would be getting married one day. I relayed this information to her mother, hoping she didn't feel he was too forward with his 5 year old love. She smiled and nodded. She said, "I have to tell you something." I got nervous. "Last week, [my child] fell down while the class was going into the cafeteria before lunch. She just tripped over her own feet and fell. The next day, totally spontaneously, Judah came over to her and told her, 'You know, I fell down one time, too. You don't have to feel bad.' And I told her that he was a friend to hold onto for a long, long time." I thanked her immensely for telling me this story; I wanted to tell her how he learned to think about other people's feelings, but decided to hold off for now..
At this point, you can imagine there are tears running down both of our cheeks, both mothers thankful for our happy children, having found friendship in each other. When I think about how cancer has affected my family, it tends to run on the negative side (that's putting it lightly). And recent days especially, have been tough, not knowing what is to blame for our bad luck, or if/when my body will ever get past the trauma. At this moment, for this very moment, I can say that one incredible thing came from the cancer mess. I may be overstating, but who cares? I'm giving myself permission: my child knows how to think about other people's feelings, and is not afraid to show someone he cares. This mama's heart is singing. Thanks for sharing such a wonderful moment. There's never been a question in our minds that Judah has that special something that allows him to see, hear and listen to others, with empathy beyond his years. If him mom's cancer made him wiser and more empathetic, then it is a glittering silver lining. But he's a lucky, lucky kid to have such wonderful, loving parents, grandparents and extended family. Sending a virtual hug, mama Mia. Fabulous and true reflection, Mimi. No doubt Judah is emotionally and intellectually gifted in his genes -- his Bop would know! -- but you are seeing truly that he has responded in the best possible way to the very deeply affecting experience of his mommy's long torturous struggle with a boo-boo on the inside. He could have responded differently, he could have become insecure or selfish or whiny, but he has taken the opportunity to develop more empathy. Whatever he does in adult life we know that he will relate caringly and respond to the subjectivity of others. 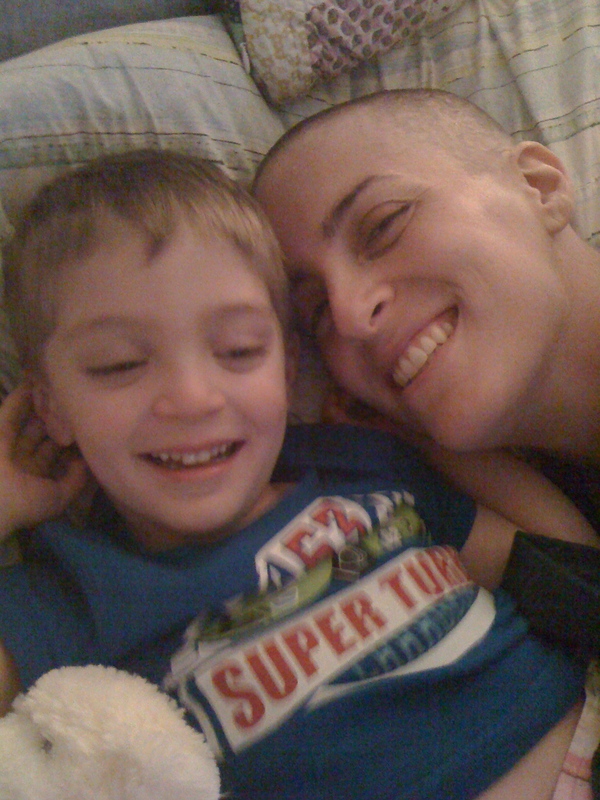 All of which is to his credit, but it is as much a credit to your (and Dan's) always- thoughtful way of including him and still protecting him during the scary, hard, hairless months of treatment. I am so admiring and proud of all of you.